I gave up on the SieMatic site. I tried, I really did, but I never found the storage containers. It's painfully slow, has a bewildering sense of hierarchy and sometimes does absolutely nothing when you click on arrows and menus. Of course, it's a beautiful sight if you feast your eyes on a particular page or whichever page you happen to end up with. Worst of all, it has the distinct feel of something written with the help of Google Translate. Here's a sentence: "Counter tops made of genuine stone are timelessly beautiful, incomparably elegant and representative." Of what? 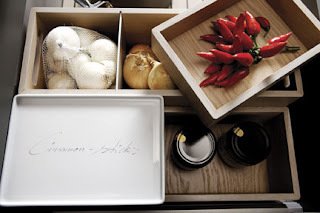 Here's another: "The many nuances and details are what make the SieMatic of your choice the object of your dreams." If that isn't computer generated prose then thankfully your site do I herewith renounce such statement. It's hard to tell, but it seems like the SieMatic S1 allows you to get email on your stove or refrigerator. Try this out: "Your wife wants a cozy evening at home in front of the television, your daughter wants more pocket money — And what exactly is your refrigerator telling you?" What? "And if your kitchen has been the heart of your house until now, this will turn everything upside down." Hold. Enough.